We are always delighted when parents ask us to conduct a service to baptise or bless their child. The birth of a baby is an amazing event and it is quite right to want to give thanks to God for his or her life and to ask God's blessing for the life ahead of them. At St Chad's we offer either a service of thanksgiving or a service of baptism (commonly called a "Christening"). Both services usually take place on a Sunday morning at our 11am service and both services involve praying for the child and asking God's blessing. Both services have Godparents (sometimes called sponsors) who promise to help the parents of the child and to pray for the child's growth in faith. The service of baptism is a rite that dates back to Jesus and the very first disciples. It is more than just a blessing on the child, as it is an entry into the church and the first step on the road of discipleship. Parents and Godparents make very important promises to bring the child up within the church and to show by their example what it is to follow Jesus. Because the promises are so important, we expect all parents wanting their child to be baptised to attend a three week baptism preparation course. This will usually take place on three consecutive Saturday mornings. If you wish to ask about a baptism and thanksgiving service then please contact the parish office on 0114 274 5086 and we will check that you live within our parish. We will then ask you to attend the 11am service so that you can speak with the vicar and he will talk through things further. There is no charge for a baptism or a thanksgiving. A thanksgiving service does just what the name suggests. It is a service of giving thanks and asking for God's blessing on the baby. There is no requirement of the family to attend church regularly or to bring their baby up to be a church member (although naturally we hope that they will do this!) A thanksgiving service can be arranged at short notice and no particular preparation is required. For parents seeking a naming or blessing ceremony, a thanksgiving service is usually more appropriate than a baptism. You might find it helpful to look at the Church of England christenings website. Who can be baptised at St Chads? We usually only baptise children of those who live in the parish. If you live outside of the parish we would encourage you to contact your local parish church. However, sometimes people have a particular connection with St Chad’s who no longer live in Woodseats but still live nearby and we are always happy to talk about baptism and the promises it involves in those circumstances. What age do you have to be to get baptised? 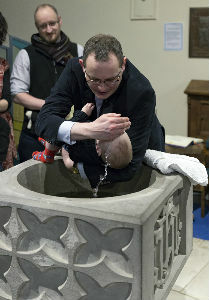 Anyone can be baptised of any age. 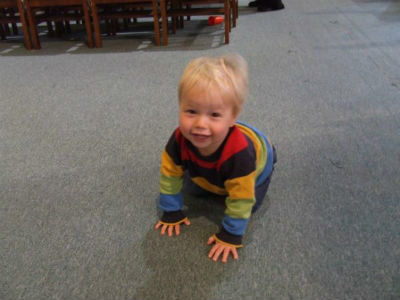 For children and babies the parents and godparents make promises on their behalf. For older children and adults they make the promises themselves. Traditionally a child will have three godparents, two of which are the same gender as the child. The important thing is that every godparent must be baptised themselves. This is because the important promises that they make must come from an understanding and commitment that they have themselves to the Christian faith. Why do you only have baptisms on a Sunday? Because baptism is a mark of entering into God’s family, it is important that the ceremony takes place when God’s family are present in the building. For that reason all baptisms must take place on a Sunday morning. However we do sometimes have thanksgiving services on days other than a Sunday. Why do some people choose a thanksgiving rather than a baptism? For many people, the promises involved in a baptism can be quite daunting. Perhaps they don’t yet feel ready to commit themselves being part of the Church, or perhaps they are not quite sure of what they believe. A thanksgiving service allows them to have their child blessed in a public ceremony without having to make this hard promises. Others feel that they would like their child to make their own decision about baptism when they are a little older, and so choose a thanksgiving instead. In the Church of England there is a special ceremony for those who were baptised as children and who later on want to confirm their faith in Jesus publicly. This is called confirmation. A confirmation service is held each year in a local church. At this service the bishop will lay hands on the candidate and pray for the Holy Spirit to come upon them. This is a significant service for those who were too young to make their own promises and baptism as they now make those promises in front of friends and family.